Dubai, 12 March 2013 – MasterCard has revealed the results of the latest MasterCard Index of Consumer Confidence, which indicates that Consumer Confidence in the UAE is steadily rising, with a score of 91.4 as compared to 86.0 in the previous edition of the Index released 6 months ago. Consumers in the UAE are ‘extremely optimistic’ in their overall consumer confidence score, and are positive about all five indicators measured in the Index. When compared to the previous edition of the survey, consumers are more optimistic about Quality of Life (95.6 vs. 88.6), Employment (95.2 vs. 88.9), Economy (94.6 vs. 89.1) and the Stock Market (86.9 vs. 77.0). Consumers also remain very optimistic about Regular Income (84.7 vs. 86.2), despite a slight decrease in its score when compared to 6 months ago. The latest findings indicate that female respondents and male respondents are equally positive about the coming months (91.4), but that consumers under the age of 30 years (94.6) are more optimistic than older respondents (90.4). “Consumer confidence levels in the UAE have been steadily increasing in our most recent indices, reflecting a positive outlook for key sectors and confidence in the UAE’s plans and vision for the coming years,” said Eyad Al-Kourdi, UAE country manager, MasterCard. Across the Middle East, the consumer confidence level remains very optimistic at an average score of 81.1, with encouraging scores for all five indicators. When compared to the previous edition of the Index released 6 months ago, consumers are most optimistic about Regular Income (85.1 vs. 89.8), Employment (80.8 vs. 85.5), Economy (80.0 vs. 84.4), Stock Market (79.9 vs. 74.9) and Quality of Life (79.9 vs. 82.9). In the Middle East, consumer confidence remains the highest in Qatar, with a score of 96.5. Qatar is followed by Kuwait (95.8), Oman (95.6), Saudi Arabia (95.2) the UAE (91.4), Egypt (66.6) and Lebanon (26.8). The Middle East’s aggregate score of 81.1 remains higher than that of Asia/Pacific (59.7) and Africa (69.6), as was the case in the previous survey. Respondents were asked 5 questions pertaining to their 6-month outlook on the economy, employment prospects, the local stock market, their regular income prospects and their quality of life. The results of their responses were converted in 5 component indexes which were averaged to form the MasterCard Index™ of Consumer Confidence (MWICC) score. 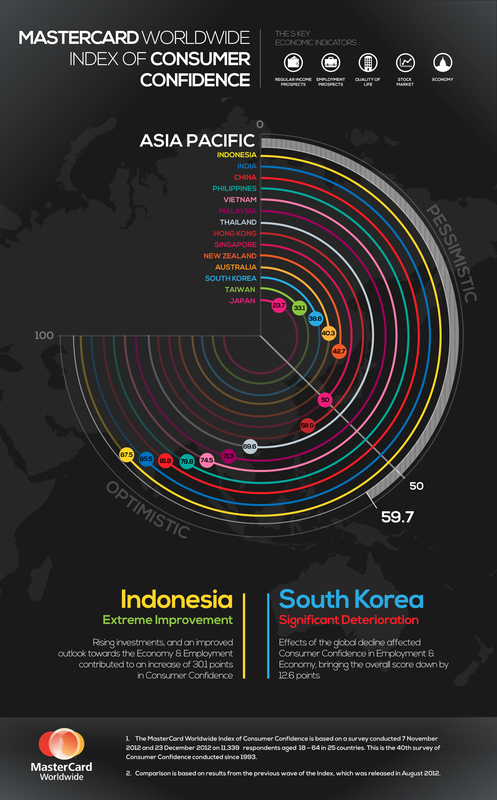 The MWICC Index score and the 5 component index scores range from 0 – 100 where 0 represents maximum pessimism, 100 represents maximum optimism and 50 represents neutrality. The MasterCard Index™ of Consumer Confidence survey has a 20-year track record of consumer confidence indices collected from over 200,000 interviews, unequalled both in scope and history across Asia/Pacific, Middle East and Africa. The MasterCard Index of Consumer Confidence is the most comprehensive and longest running survey of its kind in the region. In June 1997, the Index revealed a decline in consumer confidence – one month prior to the devaluation of the Thai baht that triggered the regional economic crisis. In June 2003, the Index score for Employment in Hong Kong dropped to a low score of 20.0. This was subsequently reflected in Hong Kong’s unemployment rate, which peaked just before September 2003 at eight percent. The survey comprising the Asia/Pacific markets began in the first half of 1993 and has been conducted twice yearly since. Markets from the Middle East and Africa were included in the Index from 2004. Twenty five markets now participate in the survey: Australia, China, Egypt, Hong Kong, India, Indonesia, Japan, Kenya, Kuwait, Lebanon, Malaysia, Morocco, New Zealand, Nigeria, Oman, Philippines, Qatar, Saudi Arabia, South Korea, South Africa, Singapore, Taiwan, Thailand, United Arab Emirates and Vietnam. The latest MasterCard Index of Consumer Confidence survey was conducted from 7 November to 23 December 2012. A total of 11,339 qualified respondents were surveyed in the 25 markets with the sample being representative of the middle and upper income groups in each market.